LearnBop has a great new way to practice math with their LearnBop for Families subscription! 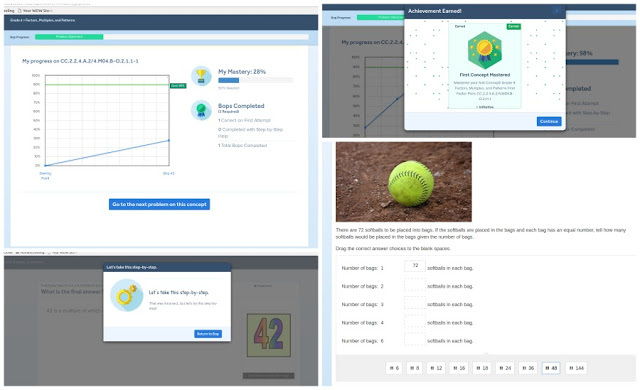 LearnBop is an interactive learning experience to help bolster math skills in grades K-12. The program is designed to respond to a student step-by-step, just like a live tutor. The goal is to help students master math skills. LearnBop collects data on the student as they move through math concepts and shows teachers/parents where gaps in the students knowledge are through a dashboard designed to be easy to use and navigate. Students also see their progress with a mastery graph at the end of lessons. LearnBop for families is a 12 month subscription service for either a single student or a family (up to four students). The single student service is $14.95 a month or $149.95 prepaid for the year. A family plan is $19.95 a month or $199.95 for the year. It is an affordable alternative to a math tutor! We used the single student plan with Sebastian, who was finishing up his third grade year. At first, I set Sebastian up in the dashboard as a third grade student. He was then asked to do a warm-up and Sebastian complained it was too easy. In fact it was VERY easy for him. I was easily able to go back in the dashboard and switch to the fourth grade math and Sebastian did a new warm-up. It was still easy, but there were a few concepts he didn't know, so I knew there was a gap in his learning so we were ready to sail with LearnBop. After completing the warm-up, Sebastian's dashboard told him exactly what he needed to do. Some of it was watching videos and solving "bops", Bops are just math problems. They even tell Sebastian that they want him to reach 90% in order to achieve mastery. Each bop is a certain concept and if the child makes mistakes, they go over it step-by-step to help him learn the concept and understand how to use it. It could take as little or as much time as you wanted in your day. Sebastian didn't like to spend too much time each day doing it, and that was ok! he could watch a video and then go do something else. He could work on a Bop and then come back the next day and pick up where he left off. If he forgot something when he went to do the Bops, the videos were linked to and he could rewatch what he forgot. The step-by-step help was also handy. The step-by-step guidance when he struggled with a concept was gentle, and if he was still struggling they had him re-watch the concept's video. It made learning easy! Sebastian just doesn't like to do school work online. He prefers workbooks and live presentations. It is his preference and I can accept that. Anyone who wants to cover some ground in math! This would be great for someone struggling and needing some remedial work over the summer. This would be great for someone who has gaps in their math knowledge and wants to bridge those gaps.